I’m always on the lookout for brands that are doing innovative things in social media. My latest find combines great marketing, customer service, and employer branding for an authentic, compassionate experience. 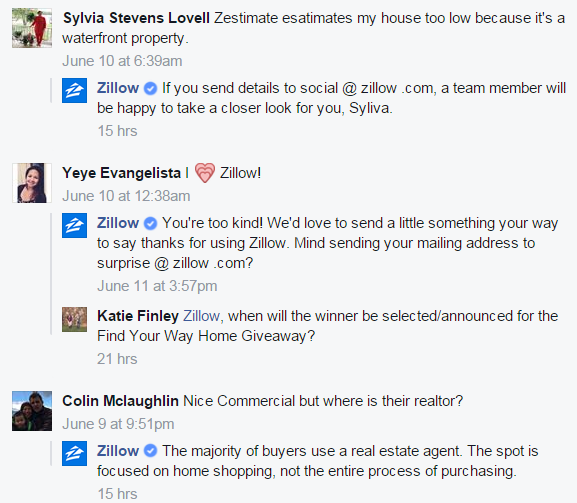 See how Zillow engages customers, job-seekers and employees through inventive social strategies. As I always tell clients, social media is a conversation. It’s not a one-way billboard to blast out your message. Still, many companies post great content on Facebook but then ignore the comments, which conveys a lack of interest or care in their fans. Not Zillow. Their social media tip is quick to respond to comments, questions, and complaints. A glance at their Facebook page shows replies throughout the comment section of every post — often within a few hours of the original query. Most wisely direct the fan to an email address for more thorough and private assistance. Some have nothing to do with recovery; one follower simply commented “I [heart] Zillow,” to which the company responded “You’re too kind! We’d love to send a little something your way to say thanks for using Zillow. Mind sending your mailing address to surprise@zillow .com?” The company gave a prize to a follower just for posting two words and an emoji! As a tech company, Zillow has been quick to jump on some of the latest innovations. Just weeks after the debut of Periscope, Twitter’s live-streaming video function, Zillow hosted a behind-the-scenes Periscope session of its Hack Week event. The result of all these efforts is a diverse feed of information, photos, and videos that conveys both personality and authority ot the brand, instead of just a stream of houses for sale. Social media is more than just Twitter and Facebook. Review sites like Yelp and Foursquare qualify as well, since they let users post updates and share content with each other. Like most tech companies, Zillow has a presence on Glassdoor, the review site for jobs. Unlike virtually every other company, Zillow’s CEO, Spencer Rascoff responds to employees’ reviews on the site. Even the negative ones that include “Disapprove of the CEO” and “Run by a spineless leader” in the headline. The responses are honest and caring, with Rascoff thanking the employees (who are anonymous) for their opinion and their time at Zillow. Sometimes it’s the CTO or the HR Director who responds. Sometimes they include an email address and invite the employee to privately discuss their concerns. It’s an incredibly bold and rare bold philosophy that speaks volumes about the company’s culture and values. Perhaps as a result, the company has a Glassdoor rating of 4.2 out of 5, while Rascoff enjoys a 98% approval rating. Zillow’s Facebook page includes a Jobvite app for job applications. It allows job-seekers to search and apply for positions at Zillow all over the country and to sign up for job alerts. The app also lets job-seekers “like” the job listings, which makes it visible to their friends, or to send a listing to a Facebook friend, making it a great referral system. Jobvite’s plug-in is simple and powerful, but not many companies I encounter use it; by doing so, Zillow stands out among its competitors. 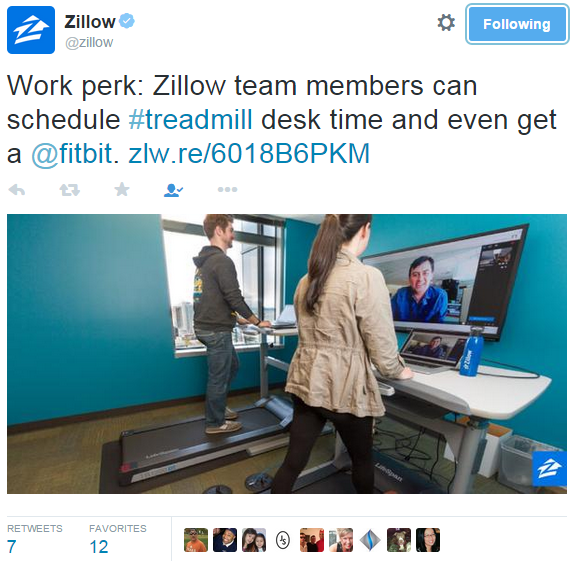 Zillow’s Twitter also sometimes veers into recruiting, with posts about employee perks and photos of employee events. Zillow has rightly assumed that its potential workers come from its fan base, who follow real estate news even if they’re not buying or selling. Zillow’s social media efforts have paid off: 272,000 Twitter followers, 1.36 million Facebook likes. The company’s Klout score is 82, putting it on the same level as comedian Amy Schumer and the New York Islanders hockey team. From Periscope to Jobvite, from fast responses to useful information, Zillow has built a brand of honesty, education, and fun. For all these reasons, I name it a Social Media Superstar. Want your social media campaigns to reach superstar status? Contact Brandemix for help. Jason Ginsburg is Director of Interactive Branding at Brandemix.